QINGDAO — It’s 670 kilometers, about 420 miles, between Beijing and this Pacific coast city of glass towers, 10-lane boulevards, sandy beaches, and 8 million metropolitan residents. On China’s high-speed white and blue bullet train, the trip takes four hours and 20 minutes. Whoosh! In the United States, meanwhile, the idea of high speed trains sounds like this — Screeeeeech! Where I live in the American Midwest two of our governors, Republicans from Wisconsin and Ohio, view passenger rail service as such a distasteful example of public investment that both refused to accept more than $1.2 billion that the Obama administration offered three years ago. The money was intended to generate jobs and begin building an authentic network of high speed rail lines and fast trains that reached from Minneapolis east to Detroit, Cleveland and Pittsburgh, and south to Cincinnati, Columbus, and St. Louis — with Chicago as its active hub. The decision by the two states recalls a similarly short-sighted and ultimately egregious strategic error made in the 1970s by elected officials in the Detroit region. President Gerald Ford, a Michigander from Grand Rapids, carved $600 million ($2.4 billion in 2012 dollars) from the federal transportation budget and offered it to Detroit and its surbuban counties to construct a regional rapid transit system. The mostly white suburbs turned the money away, largely for reasons of race. The decision ranks at the very top of the reasons that Michigan’s largest city and its surrounding suburban counties are having such a hard time attracting businesses and new residents. The Detroit area — the nation’s eighth largest market with over 5 million residents — remains the largest metropolitan area in the United States without a rapid transit network. As I asserted repeatedly during my days as a writer with the Michigan Land Use Institute, Detroit has no chance of being competitive in this century until it builds a rapid transit system. Aside from providing all residents more energy-efficient transportation options, subways, commuter trains, light rail lines, and trolleys are now must-have civic equipment to attract and retain bright young minds. Young adults don’t care much for driving, dislike owning expensive gas-guzzling and hard-to-park cars, and are content to save money and feel good for the little bit they are doing to contain greenhouse gases. Here in Qingdao, the major boulevard running parallel to the city’s ocean shoreline is periodically interrupted by construction sites, where men and machines are building a new subway system and underground station stops. The city’s big passenger rail station sports an immense white canopy, unfurling like a huge sail, that shields the new high-speed rail platforms from rain and intense summer sun. In the last two years I’ve boarded brand new subway lines in Beijing, Shanghai, Chengdu. I’ve boarded high-speed trains in Tianjin, Harbin, Shenyang, Xinjiang, Beijing, and Shanghai. Four years ago, when the first high-speed train left from Beijing to Tianjin, attaining speeds in excess of 300 kilometers an hour (more than 180 mph) Chinese rail authorities promised to build a 16,000-kilometer national network, or nearly 10,000 miles. According to Chinese press reports, 13,500 kilometers have been built. In China, just about the only impediment to the frenzy of rail construction is safety. Riders board subways and high-speed passenger trains here with the same sort of anxiety that Americans board planes. In February 2011, Liu Zhijou, the rail minister and high-speed rail fanatic who promoted the system, was ousted and is now facing six serious corruption charges. 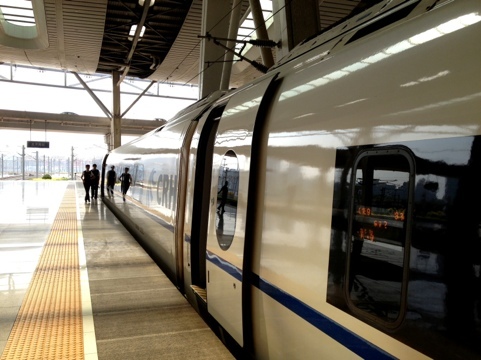 Six months later lightening disabled a high-speed train in Wenzhou, south of Shanghai. Another train on the same track missed a signal and rear-ended the halted train killing 40 people and injuring over 200 people. Four cars fell off the trestle where the accident occurred. Fifty-four more railway officials were punished. There haven’t been any other serious high-speed rail accidents since, in part because the pace of construction slowed, along with some of the trains. Still, there is justifiable concern about personal risk. Two months after the Wenzhou accident 280 people were injured in a Shanghai subway crash that was blamed on human error. And a lot of Chinese worry about construction quality. China, I was told today by an American who teaches here and has friends in the industry, is the only country in the world that produces buildings that look 20 years old the day they open. That’s not true. But it closes in on a valid point. In November 2011, a building under construction collapsed in Guandong Province, killing six people. Last month, a 300-foot section of a brand new elevated highway leading to a bridge in Harbin, a big city in northeastern China, collapsed in the oddest way. It didn’t crack in the middle, like a broken stick. Instead it fell off sideways, the entire section like a long board leaning against concrete bridge supports. Four big trucks fell with the highway and were crushed in a heap. Three people died. These stories add to the future-shock uneasiness that many Chinese articulate when they describe their country’s momentous development. I admit it. I board high-speed trains here with a big helping of awe and a dash of nervous dread. The former, though, overwhelms the latter. On the trip from Beijing to Qingdao, the train so effortlessly accelerated to a top speed of 306 kilometers per hour (190 mph) that nothing gave away the surge other than the houses passing in a blur. The train hardly stirred. The sound was a slight snuffle, like standing on a beach in a gentle wind. Walking up the aisle at top speed was as steady as a stroll on a narrow sidewalk. The ticket for my comfortable seat was 475 RMB, or $75. A year ago I was in Chengdu and sat down with a group of young American business reps from Caterpillar, the big Midwestern construction equipment maker. They’d taken the high-speed train from Shanghai and marveled. “That thing was great,” one of them said. “We need that in the U.S.” His mate, though, talked about the cost and subsidies and waste of rail. It was evident they supported the ideas that, like so many other essential investments needed to thrive in this century, are keeping high-speed rail on a political and economic side track.